PRESIDENT BARACK OBAMA: Well, hello, everybody. Benvenuto. I want to welcome Prime Minister Monti to the White House for his first visit. I had the opportunity to congratulate him after he took on the extraordinary responsibilities that he has accepted. I want to begin by saying that it’s nice to be able to return the hospitality of the Italian people. Every time I’ve been to Rome and L’Aquila (ph), the warmth that has been extended not just to me, but to my family has been extraordinary. And you know, obviously we have a deep and special connection with the Italian people, and the Italian-American community here in the United States has had as much of an impact as any group within our country. I personally cannot claim Italian ancestry, although my name ends in a vowel, so — (laughter) — sometimes I try to pretend. You know, the prime minister came in at a very difficult time in Italian politics and the Italian economy, and I just want to say how much we appreciate the strong start that he has embarked on and the very effective measures that he is promoting inside of Italy. You’ve already seen because of his stewardship and his experience and his knowledge of economics that not only has he boosted confidence within Italy about a reform agenda, but he — he’s also been able to generate confidence throughout Europe and in the marketplace that Italy has a plan that takes seriously its fiscal responsibilities, but also emphasizes the need for structural reforms that can promote growth. And so one of the topics of our conversation, obviously, was my continuing to encourage the fine work that has already been done by the prime minister and express our interests in doing whatever we can do to help stabilize the situation in the eurozone, including something that we both agree on, which is the need for a stronger European firewall that will allow for a — a more stable path for repayment of debt, but also the promotion of a growth strategy within Europe, which is obviously important not only to Europe, but the entire world economy and to our economy back here in the United States of America. In addition to all the burdens that he has economically, Prime Minister Monti also is the leader of one of our most important friends and allies when it comes to security issues. So I emphasized to him how much we appreciate the sacrifices and outstanding work that are made by Italian forces in Afghanistan. And we have reaffirmed our commitment to the Lisbon schedule in which we transition to full Afghan lead by the end of 2014. I emphasized the fact that we could not have been successful in our Libya campaign without the extraordinary contributions of our Italian partners. And we both expressed our interest in working with the transitional government there to create a — a stable pathway towards democracy and economic prosperity. We discussed the extraordinary efforts that Italian forces have taken in Kosovo to continue to maintain the peace there and to deal with ongoing tensions. And we discussed a wide range of diplomatic concerns, including the situation in Syria, where we both have a great interest in ending the outrageous bloodshed that we’ve seen and seeing a transition from the current government that has been assaulting its people. We also discussed how we can continue to encourage a peaceful and effective transition elsewhere in the Middle East. And we discussed the situation in Iran. And I thanked Italy for its participation in a strong sanctions regime. We also both said that we would work as hard as we can to find a diplomatic resolution to that very difficult situation. So, overall, you know, I think that the relationship between Italy and the United States has never been stronger. I personally have great confidence in the prime minister’s leadership and his ability to navigate Italy through this difficult time and to stabilize the economic situation there and then put it on a footing so that it can grow and prosper over the long term. And I know, given the extraordinary talents and gifts of the Italian people, that with these structural reforms there’s no reason why the future for Italy will — should not be extraordinarily bright. So Mr. Prime Minister, welcome. We thank you very much for your friendship and we wish you the very best in the months to come. 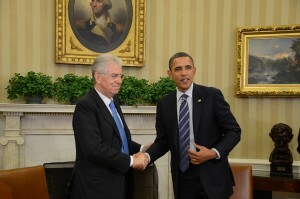 PRIME MINISTER MARIO MONTI: Mr. President, thank you so much for having me today at the White House. It is a great privilege and an honor to have the first meeting with you after our telephone conversations and to hear directly from you your vision about world affairs, and in particular the economic cooperation and the common challenges that the U.S. and the European Union — and within it, Italy — have to tackle. 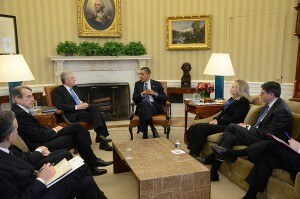 The meeting with the president has been ranging through a number of topics, as the president himself just mentioned. We, of course, devoted particular attention to the efforts going on in Italy. And I do wish to warmly thank the president for his generous and supportive words, which in itself are an encouragement for my government to persist along these lines. And I’m glad to say the lines towards budgetary consolidation and structural reforms, however painful they may be in the short term, seem to be widely understood by the Italian public opinion. And I think this is a good basis for also the future of the country and whatever will be there after the (time- limited ?) duration of the current government. With President Obama, we went through the interactions that exist in Europe between the efforts by any particular member state and the overall governance of the European Union. I found in him a deep interest and, can I also say, thorough knowledge of these intricate mechanisms of us, the Europeans. And we agreed on the strategy in order for Europe to consolidate its budgetary position to cope with the financial sanctions. And in particular, you heard the president mention the importance of adequate firewalls, and also the imperative of growth, growth which can only come, particularly in Europe, from structural transformations giving more role to productivity, enhanced efficiency. And I think the U.S. is a very good case in point providing examples on the benefits of a well-functioning market. And of course the U.S. is the living example of what a single market can provide in terms of growth. And this explains why in Europe, Italy is so insisting, finding more and more audience among the other member states, on the fact that Europe’s programs for growth should rely heavily on an enhanced effort for the single market. I will not go through the various points concerning the strategic agenda in the area of security that the U.S. and Italy share. I confirm the firm willingness of Italy to play its role within this alliance, which is a strategic alliance, but which is first of all an alliance of values, common values that we defend. And I strongly support President Obama’s renewed intention of Italy to provide not only the necessary resources and women and men for these tasks, but also the knowledge and expertise that Italy may have as regards particularly some countries in the Mediterranean and the Middle Eastern region due to geographic and historical links. So we are, Mr. President, and I personally am very encouraged by this thorough exchange of views. It was difficult to identify points where there isn’t agreement. But it was easy to identify points — first and foremost, economic growth — where we have common views but we need to step up joint actions in order for our wishes to become reality. And finally, if I may conclude with a sentence in Italian, Mr. President: sono consapevole della grande importanza, il Presidente ha voluto ricordarlo, della comunità italo-americana nella storia di questo Paese, nel presente e, sono sicuro, nel futuro di questo Paese. Questa relazione è di grandissima importanza anche per l’Italia e tutti i progressi che nel Paese potremo fare per rendere l’Italia più moderna, più solida economicamente e più orientata alla crescita. Spero avranno anche l’effetto di rendere ogni cittadino italiano o italo-americano, residente negli Stati Uniti, più orgoglioso di questa componente di italianità. Thank you so much, Mr. President. And I apologize, I forgot my translation during my long speech. But I — rather than try to repeat it now, if anybody needs a translation — (laughter) — we’ve got the translator right here. So, thank you very much, Mr. Prime Minister. PRIME MIN. MONTI: Thank you. Q: Sir — (off mic). PRESIDENT OBAMA: Thank you, everybody. Thank you. STAFF: Thank you, everybody. Thank you, guys. PRESIDENT OBAMA: Thank — thank — thank you, guys. PRESIDENT OBAMA: Come on, guys. Thank you. Come on. Thank you.